Graceful lines and gorgeous details give the Giselle Collection an aesthetic you will not find in your average bathroom vanity. With matte gold hardware, a gleaming Carrera white marble top, semi-recessed vitreous china sink, and a stunning natural walnut finish, the Giselle 33 inch vanity combo commands attention without being ostentatious. An open shelf and roomy soft-close drawers deliver ample storage. Giselle transforms a blah bathroom into a luxurious spa. Pair it with the matching mirror to complete the look. Add a breath of fresh air to your bathroom with the Jameston Collection from Avanity. 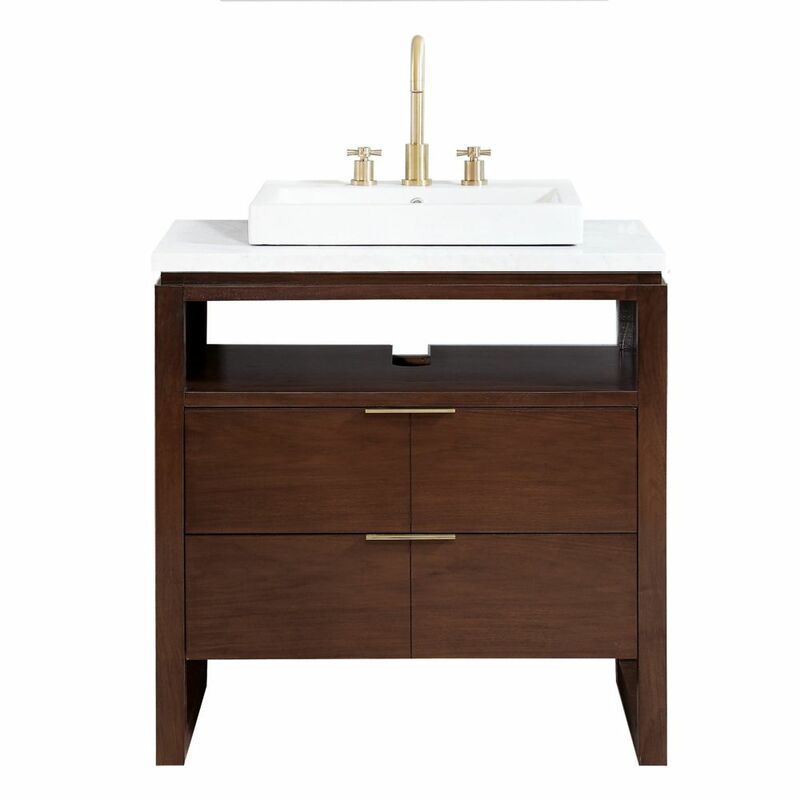 With its open cabinet and solid teak construction, the Jameston 33-inch vanity combines functionality with beauty. Two soft-close drawers provide additional storage for organizing towels and toiletries. Teak provides durability without sacrificing elegant styling. Available in both natural and rustic teak finishes. The combo includes a natural carrara white marble top with integrated sink. When searching for a perfect vanity to complete your vision of the ultimate spa-style bathroom, you want style and function - the Simpli Home Chelsea Bath Vanity offers both. Constructed with a solid hardwood frame and legs, the Chelsea presents a luxurious, contemporary centrepiece for any bath upgrade. A soft white cabinet paired with a white countertop and sink brings a light, airy feel to your space, easily complementing any colour scheme or decor style. With spacious interior cabinet storage and four drawers, you'll enjoy plenty of room for bath essentials and more. Giselle 33 inch Vanity in Natural Walnut with Carrera White Marble Top Graceful lines and gorgeous details give the Giselle Collection an aesthetic you will not find in your average bathroom vanity. With matte gold hardware, a gleaming Carrera white marble top, semi-recessed vitreous china sink, and a stunning natural walnut finish, the Giselle 33 inch vanity combo commands attention without being ostentatious. An open shelf and roomy soft-close drawers deliver ample storage. Giselle transforms a blah bathroom into a luxurious spa. Pair it with the matching mirror to complete the look.